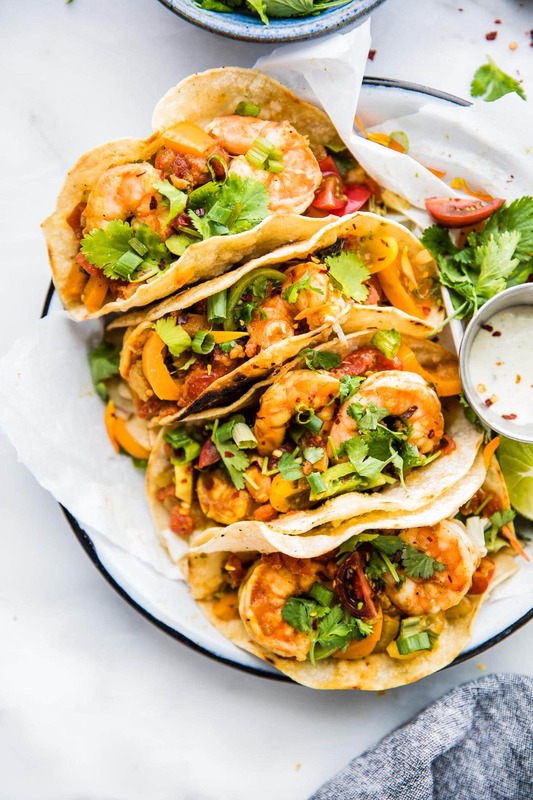 Gotta love the ease of these Crock Pot Fire Roasted Tomato Shrimp Tacos! A Crock pot tacos recipe that requires little prep! Slow cooking the shrimp with fire roasted tomatoes (and other vegetables) produces delicious flavor and preserves nutrients! 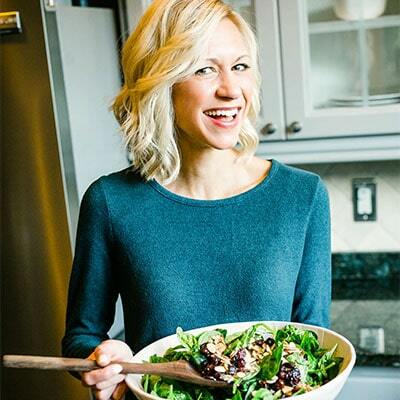 A healthy make ahead dinner for busy weeknights, meal prep, or entertaining! Paleo option included. Just letting you know this Fire Roasted Tomato Crock Pot Shrimp Tacos recipe was originally published in Summer 2015. I retested the recipe, rephotographed, updated content for you today. I hope you enjoy. Thank you for following Cotter Crunch Y’all!. There are certain weeks were all my blog posts have a mutual “theme.” I’m pretty the last few weeks have been all about reviving my oldie but goodie recipes. Like this salad and this cake! Then there are weeks where I totally post recipes via instant inspiration. Remember my almond butter cups and plantain breakfast Lasagna? Ya, those food posts were on accident, happy accidents. And I think this week is going to be another themed by accident week. Which I am sure you don’t mind, right? What’s this week’s theme? Well… three words. Easy LIGHT meals! 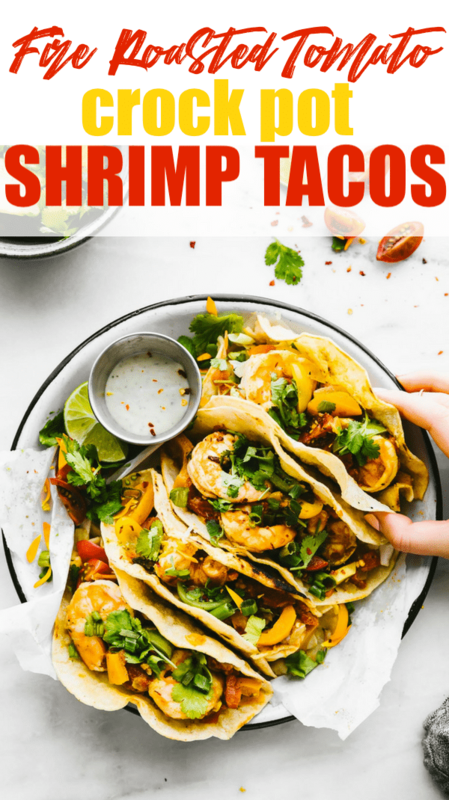 But this crock pot shrimp taco recipe is also an oldie but goodie recipe that just got an upgrade. YEA buddy! So maybe the theme is more… Upgraded Gluten Free Easy Light Meals. That sounds more like it. Yes, I like that. You’ll see what I mean when I post the other recipe this week. Okay but really, whatever title I call it, it has the same connotation. And just because the weather is warmer, eating gluten free (and healthy) shouldn’t be making you more busy. Hence the help with the crock pot. Ya know? So let’s talk about this theme and my love for the spring and summer crock pot recipes. If I could have it my way, I would act like Oprah and buy everyone a crock pot (or slow cooker). Because the crock pot is AMMMMMMAZING! Slow cooking food makes it more flavorful without much effort! 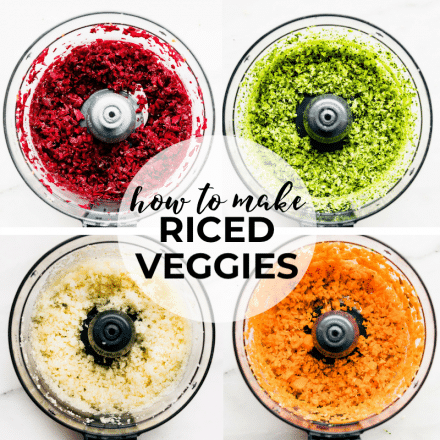 You can pack it full of nutrients and flavors with just your favorite meat/vegetable of choice. Then hours later, VOILA! You’re a whiz in the kitchen! Yep, slow cooking even works with seafood. 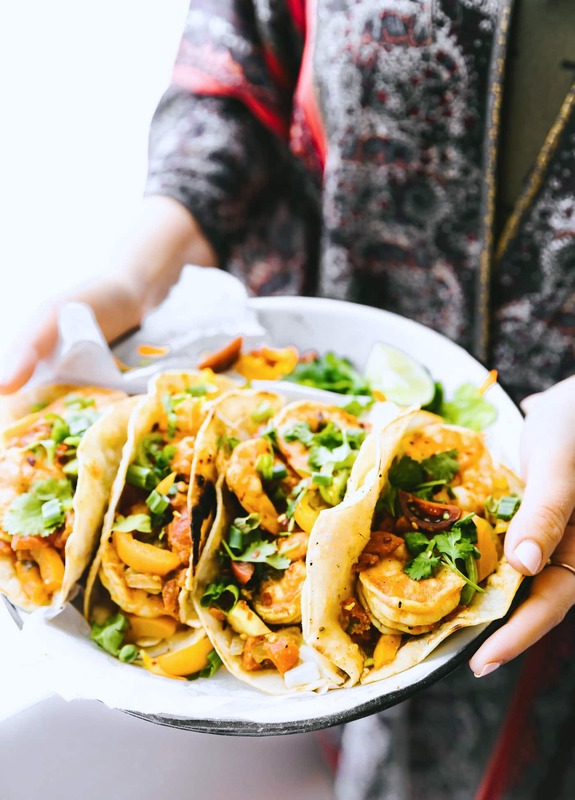 Ahem… may I present the most flavorful juicy shrimp tacos EVAH! But what I think is most VALUABLE about the crock pot is that it keeps more NUTRIENTS in your food versus cooking it out. What does mean by this? You see, since the crock pot is sealed and covered on low heat for hours, there is less light and heat exposure and toxins consumed compared to when you grill, fry or broil meats/cheeses. But even the little bit of nutrients cooked out can still be added back in. You see, if you are able to eat and use all of the ingredients (stewing liquid and all) in the meal, than you’d actually be getting some amount of the nutrients that were lost from the meat/vegetable back in! Haha, does that make sense? Either way, slow cooking can save us time, energy, but preserve nutrients. Which leads me to this meal. Crock pot Fire Roasted Shrimp TACOS! Yep, I used ALL of it, juices and all. That means I am one nutrient rich woman right now! Haha! 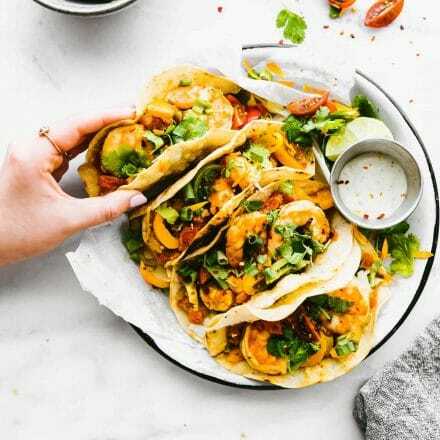 Fire Roasted tomato Shrimp Tacos are Gluten Free with a Paleo Option. Slow cooking the shrimp with fire roasted tomatoes (and other vegetables) produces delicious flavor and preserves nutrients! Optional toppings – extra chopped green onion, sour cream, avocado, jalapeno pepper, etc. First make sure your shrimp are peeled and tails off. If you are using frozen shrimp, quickly thaw in water for 10 minutes, then peel. Layer your raw shrimp at the bottom of pot. Drizzle with 1 tbsp olive oil. Then mix in your chopped onion. Drain your canned fire roasted tomatoes and then pour it over the shrimp. Stir together. 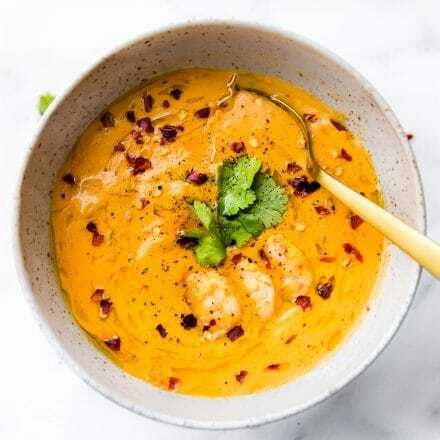 Add your bell pepper and the rest of your ingredients, including your seasonings and cilantro. Stir all together. Place slow cooker (crock pot) low for 2-3 hrs. Or high for 90 minutes to 2 hours. Check on shrimp around 1 hour of cooking on high. If they look almost done, place on medium for another 30 minutes to hour. They should be seasoned nicely and pink, similar to that of steamed shrimp. Serve with gluten free corn or paleo tortillas, chopped cabbage/salad, rice, or avocado! We use sizzlefish wild caught shrimp for best flavor and freshness! If you don’t have chili powder, you can use a taco seasoning or other Mexican seasoning of choice. Be sure there is no added gluten ingredients. For extra thick tacos, use a chunky salsa with lots of vegetables. But really, using the juices from the tomatoes is key for spice and flavor! A flavor that you can switch up. Meaning, instead of tacos, you can serve it over rice, potatoes, pasta, etc. You see what I am saying here? Personally though, I like with a little extra kick in my tacos. Hey, we live in Texas, spicy food and tacos are like daily consumption. 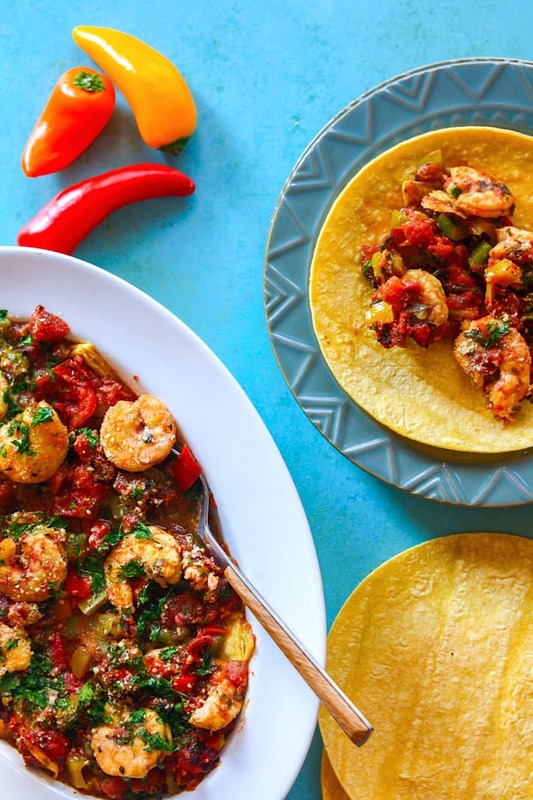 Taco Tuesday should be practiced daily, so go ahead, bust out the crock pot, preserve those nutrients, and celebrate with a little fire roasted tomato and shrimp! Favorite Spring or Summer crock pot recipe? Ever tried making shrimp tacos in a crock pot? looks delicious! I love crockpots but hate cleaning them! As for my fav… split pea soup! So easy in the crockpot and I love coming up to the smell of soup! Shrimp, I have actually not cooked in the crockpot, genius! this was actually easy clean up. No stick! YAY! I too hate cleaning my crockpot! A friend introduced me to Reynold’s Crockpot cooking liners. They are AWESOME! Can I just eat (more like devour) the taco filling? I don’t need no tortilla. Give me a spoon. Now. 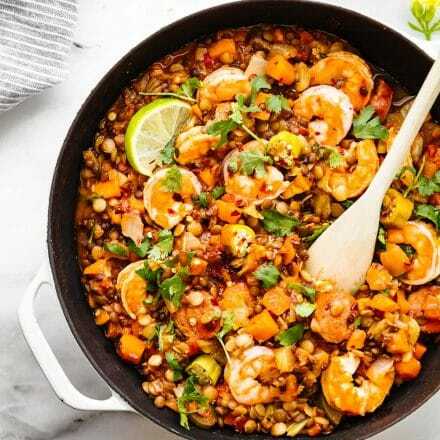 I had no clue you could cook shrimp in the crock pot and my favorite crock pot recipe is your BBQ Lentil one…Going to need to find another one of yours to cook this winter, that will keep me warm…LOL! i was in honduras last week and still, somehow, did not manage to eat enough latin american food. will definintely be trying to make these soon! also, i’ve been on a tostada kick recently and these shrimp would be so perfect. um, let’s both go back and get more latin food fixes! 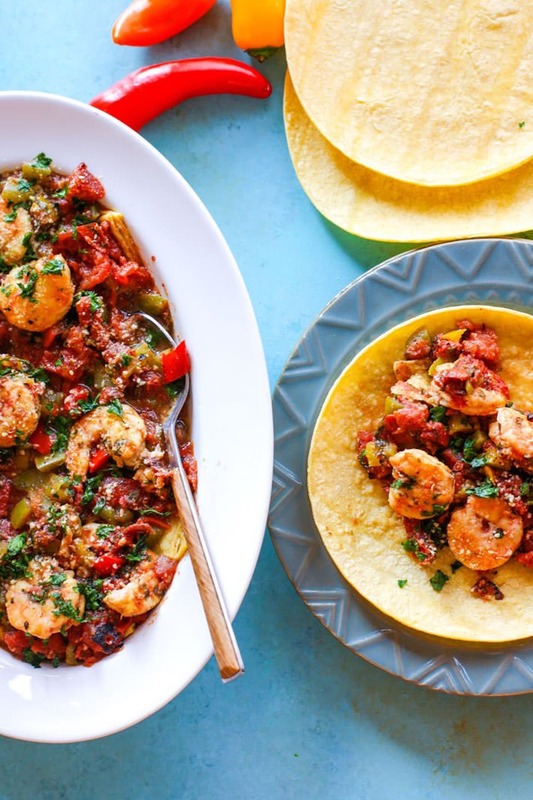 shrimp, tacos, and crockpot in one recipe?! I mean, could it actually get any better! I love it all and I am going to make it really soon! You know I’ll never turn down a crockpot recipe! I actually need a bigger crockpot. Mine is a little too small. I’ve never tried doing fish in one though. I must try! I was just looking for more crock pot dinner ideas…this is perfect! Sharing with my Fresh Fix group, too! I live for my slow cooker and bow down in her presence- she’s like having a sister wife, now if she’d only do laundry I’d let her take our last name. I just bought shrimp at a Costco road show- I was going to make shrimp cocktail to nosh on all week, but this might be a better use for those beauties. So easy! What a great go-to meal for any time of the year! 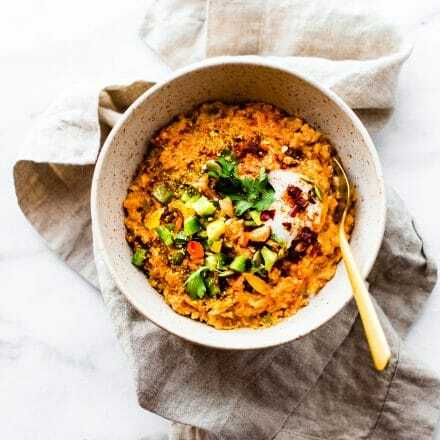 Also, your food styling and photography on this post is beautiful! Ahhh … how wonderful! To be honest, I haven’t had too much success with my fairly recently acquired crock pot, so I think I need to branch out a bit more this coming ‘crock pot season’ (although why not use it year-round?) Just love the idea of these tacos … so far from my idea that everything from the crock pot is in a watery brown sauce! Can you please come cook for me this week? I’m craving fresh home cooked food and finding it really hard to get time in the kitchen. Add in stress and it’s even more important I know to eat well but oh so hard. we need a getaway together where we can just relax and cook! Yet another reason to love my crock pot! I love how easy this would be to throw together. And by the way, I saw Hatch chili tortilla chips at the grocery store yesterday and I thought of you! let me know if you do liz! I will swap in scallops and my life will be complete! Hi there! 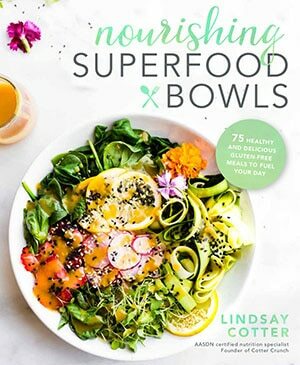 Love the idea of adding squash or zucchini! If I do,do you think I would need to increase any of the seasonings/ liquid/ peppers? Sorry, I know those types of questions are annoying. 😉 I just didn’t know if the original recipe has enough extra liquid. I think I’ll try this out this weekend! never annoying. i would keep the juice from the tomatoes then. If you use the canned. It should be good! Keep me posted. Your recipes are genius! Shrimp tacos were my favorite as a child. Every day should be Taco Tuesday. oh i love this! childhood favorites are the best as an adult! haha. I just printed out this recipe so that I could remember to make it next week! 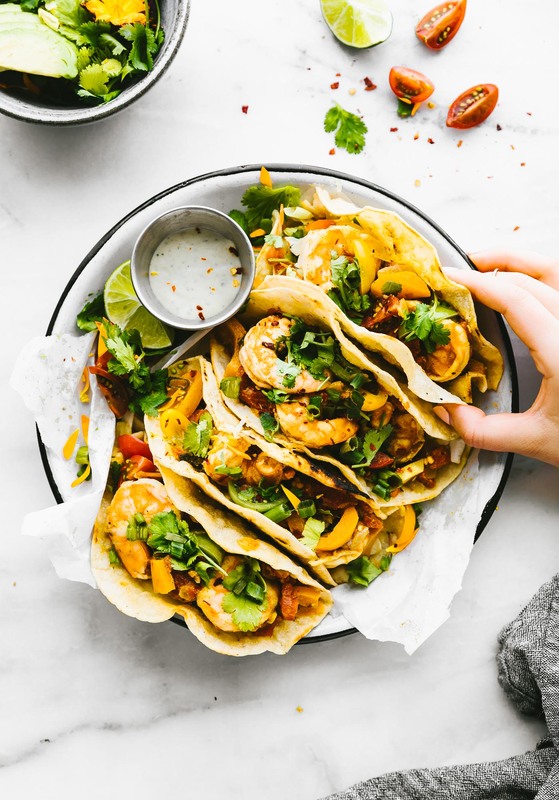 You have combined two of my family’s favorites (shrimp and tacos) in my favorite appliance — the slow cooker! 🙂 It doesn’t get much better than that! Ok as soon as we buy a crock pot here in Australia I will be making this! So easy and I love it! Also thinking it would be an amazing filling in a sweet potato! Favourite crockpot recipe is nomnompaleo’s kalua pig – you should totally check it out! I know you would love it! Yum! These look so good! My favorite crockpot meal is probably a Mexican seasoned pulled chicken… it’s stupid easy and delicious! Either that or just your traditional pot roast. Also, I thought you’d appreciate knowing this-just celebrated our 4th wedding anniversary with the Mr. and he cooked me scallops for the first time ever! So romantic! yay for scallops! did he eat them too? and congrats on 4 years! All of your Mexican inspired dishes this week are speaking to me! Get in my pregnant belly! you should move here for 9 months! i’ll feed you! 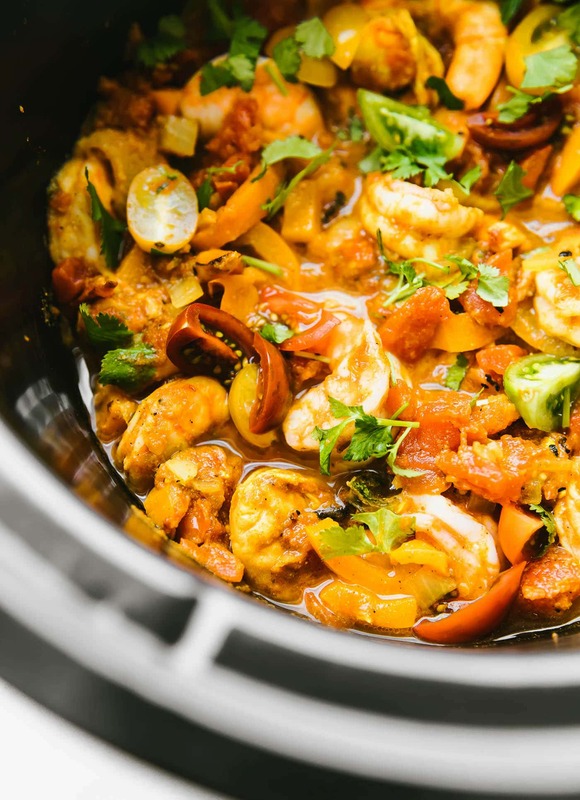 I haven’t ever cooked shrimp in my crock-pot but I love the looks of this recipe! Well – Atlantan’s have tacos everyday too …well, most everyday at least…though sometimes, I skip the tacos and just dig a spoon into whatever was supposed to be the filling! And I think I must be psychic, cos I see myself digging my spoon into this crockpot too! I love your combo of shrimp with stewed tomatoes, salsa, and cumin, among others! This looks AWESOME. 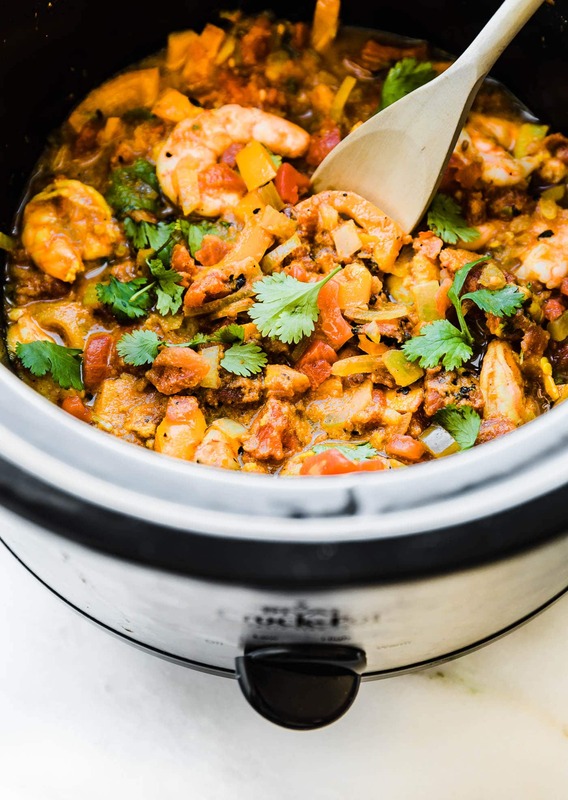 I love finding new slow cooker recipes that aren’t just shredded chicken, even if it is super versatile. I love how fresh and easy this is! I wouldn’t mind a daily taco habit. In fact, if it weren’t so hot, I’d scurry right on down there. It’s getting cooler here so my crockpot will be coming out to play soon. Usually the first fall recipe in it is chili. I might need to switch that up to these tacos. Oh my oh my oh my. I’ve never seen shrimp in the crock pot!! This looks so incredibly tasty. Oh my gosh, Lindsay, if I were to dream up my perfect meal, this would be it! I’m a total shrimp addict, love fire roasted tomatoes and of course, I’m all about fresh, simple and easy! Love the heat, the fresh cilantro – a great recipe all around. Thanks for giving me a reason to finally buy a slow cooker, lol. Hope you’re enjoying your weekend, friend! coincindentally I just pulled out some shrimp from the freezer not knowing exactly what to do and wouldn’t you know it this recipe popped up on my Pinterest feed. Colors look beautiful, ingredients fragrant, and easy peezy in a crock pot — this is a winner. I just happen to have all but one ingredient so yup I will be trying this tomorrow! Where have I been and how did I miss this? This recipe rivals my recent shrimp taco recipe that’s the new favorite in the Conyers’ house. I made this tonight and really enjoyed it! It felt very light, clean, and healthy. I added 1/2 onion, a zucchini, and extra garlic. Next time, I may try adding a few jalapenos or red pepper flake because I like it hot! 🙂 I served it over quinoa and topped it with cilantro and cotija (instead of going the taco route). Yummy! Thanks for the recipe! I’m doing a Mexican Fiesta themed housewarming party and this will be perfect!! Super easy crockpot recipe – perfect for entertaining guests! Thanks for sharing! wonderful! keep me posted!! and congrats. Thanks for sharing! Fyi: cook time (near the beginning) is listed as 3 mins. oh whoops! thanks for catching that Shea! So perfect for a weeknight meal! I’ve never done shrimp in the crockpot. What a great idea! These are basically my idea of heaven. WANT. Those shrimp look so giant!! I love shrimp tacos! These look so perfect. You’d love these with your low carb tortillas Carolyn! I love tacos! These look amazing! Can’t wait to try! Wow I didn’t know that the slower cooker keeps more of the nutrients in; right now we have a crockpot ham and cabbage stew going. 🙂 These tacos look BOMB.com! These have me counting down the days until Taco Tuesday!!! Love the seafood twist from the standard meat taco! Shrimp is one of my favorites. 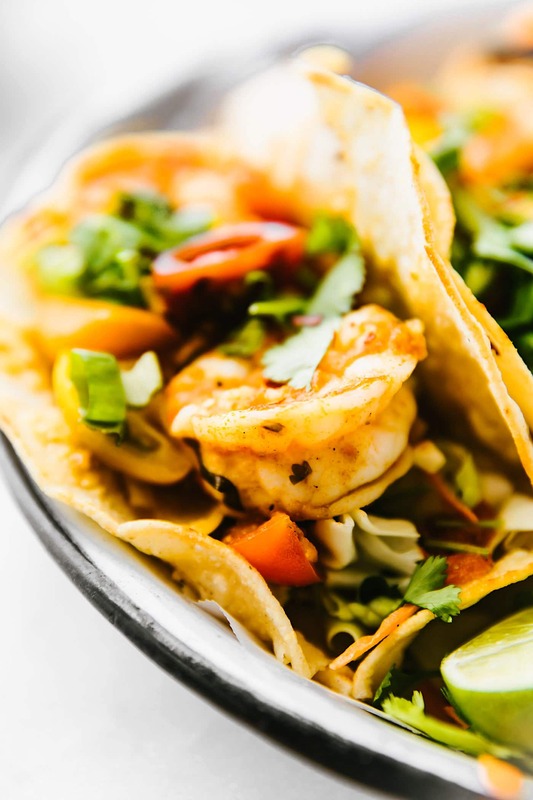 Shrimp tacos are the best! These look insanely good! Used leftovers to make shrimp nachos with queso fresco. Sooo good! OMG that’s genius! Haha gotta try that. I made the version found here: https://www.sizzlefish.com/blogs/shrimp/crockpot-roasted-shrimp-tacos, but still delicious. I omitted the onion (not in the other version), bell pepper, and cilantro (I didn’t have those ingredients on hand and forgot to buy some), used fresh raw shrimp, 2 Tbsp salsa, and drained some of the juice from the tomatoes. Kept all other ingredients and cooked on high for an hour. I served on street-style corn tortillas with avocado and chevre cheese. Light, easy to throw together, no heating the house with the oven, and delicious. Didn’t even miss the omitted ingredients. Will definitely be making again. Oh that’s wonderful to hear! did you see this recipe first or the one on sizzlefish? I post that one a long time ago there and updated it new here. Both delish. Love the swaps you made! Oh I am so glad! What a fun dinner party and thank you so so much for taking time to report back. I love it Holly! I didn’t have fire roasted tomatoes so I used a can of Rotel diced tomatoes and green chilies and it still turned out AMAZING!!! The shrimp were so perfectly cooked 😍👌🏾 I will 100% make this again (and again and again)! Oh yay! Thank you monica for the feedback! Is thawing the shrimp absolutely necessary, or can I put them in frozen? that should work! no need to thaw. These were the best last night! Got nice big wild caught shrimp at my local Fresh Market store in Hingham, served them with tortillas that said they were better for enchiladas so we could stuff more in then served them with guacamole, shredded mexican cheese and sour cream – yum, with a mexican rice on the side! YUM!